For the first edition of ‘One Project’, the Kunsthal Rotterdam and gallery West Den Haag brought the leading international German-Norwegian video artist Bjørn Melhus (1966-) to the Netherlands. 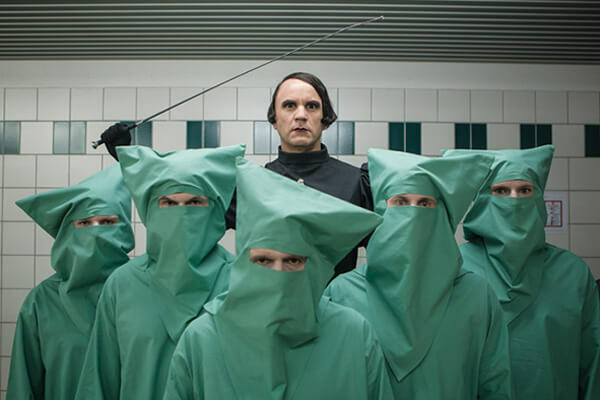 His remarkable short films and video installations play with concepts like identity, media, globalisation and mass culture. He addresses social themes at their very core in a stimulating, sometimes absurd tone and with eccentric design. The multi-channel installation ‘The Theory of Freedom’ focuses on the definition of freedom. Parallel presentations of Melhus could be seen in West Den Haag, Art Rotterdam and the IFFR. The first debate ‘Me against Us’ was held during Art Rotterdam in connection with the social critique of Bjørn Melhus’ work. The Kunsthal Rotterdam introduced a large-scale solo exhibition to the Netherlands by the Czech artist Krištof Kintera. Full of irony, with almost slapstick-like, sometimes dark humour, Kintera’s installations appeal to the imagination while addressing politically charged themes. His work is overwhelmingly full of fantasy and powerful and subtly provides food for thought. The sculptures and installations of Kintera’s ‘life’ can move, communicate, dysfunction and are sometimes completely absurd. 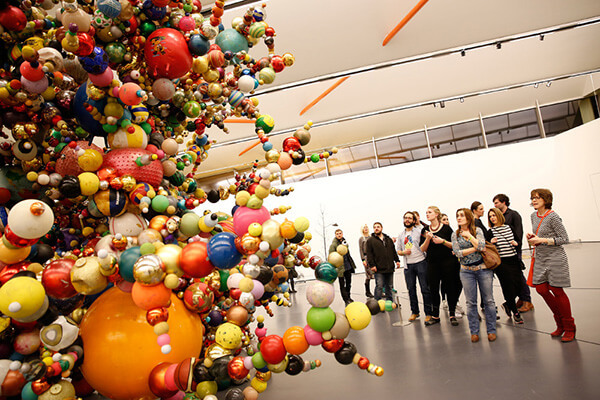 Visitors to the exhibition were sucked into Kintera’s world: a special experience and a must. An important role is played in the work of the Belgian photographer Charlotte Lybeer (1981-) by the interaction between the virtual and the real world. Inspired by films and games, the people she portrays seem to travel to an in-between world in which they assume a different identity and temporarily escape from everyday reality. The exhibition ‘The furry adventures of the Cabbit and the Folf’ in the Kunsthal Rotterdam presented more than thirty works by Lybeer in which she followed people – ‘furry fans’ and ‘zental members’ – who meet by arrangement and conceal themselves inside another ‘skin’. 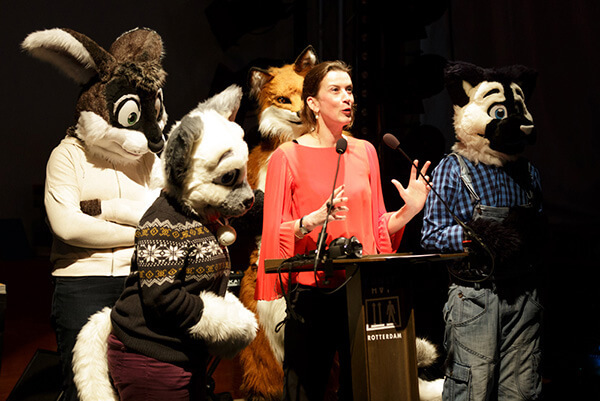 There were also several furries present at the opening, which was held during the Freaky Spring in the Kunsthal. 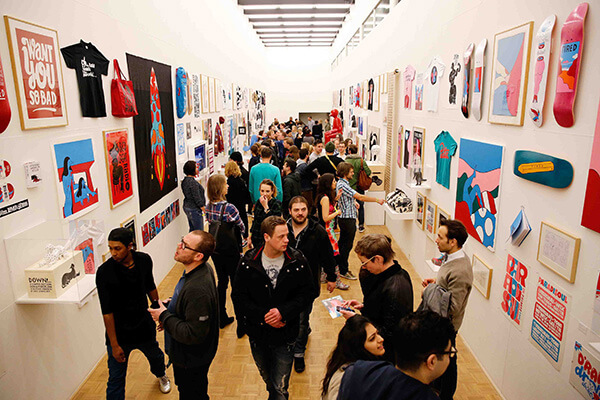 Work by the Dutch artist Parra (Pieter Janssen) could be seen in the Kunsthal Rotterdam from 7 March. 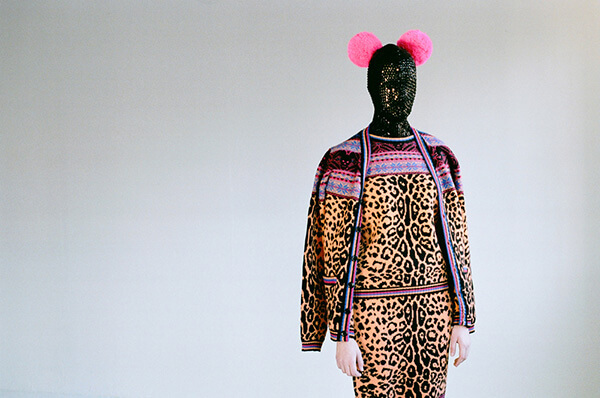 His style is recognisable, absurd, playful and ironical. Parra’s work is characterised by modern ‘post-pop’ drawings with bright colours and an idiosyncratic typography. His world consists of hybrid, bizarre and surrealist figures – men with bird heads and voluptuous women with sensual bodies – combined with texts that range from sarcastic and introvert to ironical and meaningless. Parra has developed to become a recognised and creative maker of images who designs special editions for established brands and exhibits his free work all over the world. Specially for the exhibition Parra made a mural approx. 25 x 6 m in Gallery 3. The opening of the exhibition was accompanied by a performance by Parra’s own band Le Le. It marked the start of the Freaky Spring, along with Museum Night 010. Thera Clazing graduated in 2014 from the Fine Art department of the Utrecht School of the Arts. 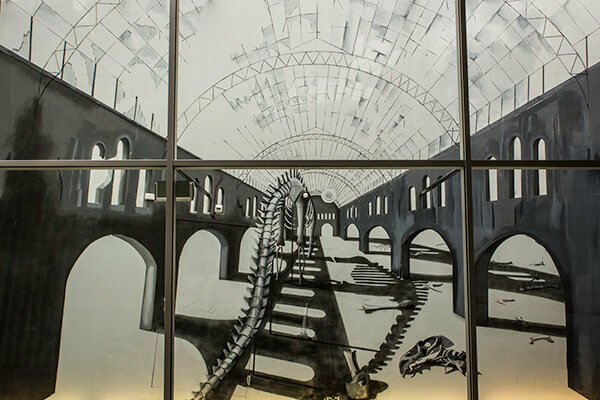 Using latex and charcoal, she draws and paints on walls endless, desolate landscapes with skeletal structures of animals. The viewer is left to guess at what has taken place. The painted objects present a possible story full of suspense, anticipating a lugubrious twist. You suspect the existence of characters without anyone being present. Clazing’s work for Kunsthal Light #10 showed an oppressive loneliness and made viewers feel what they could not see. An Artist Talk was held on Saturday 18 April. Willem Jardin, tutor in the Fine Art department of the Utrecht School of the Arts, interviewed Thera Clazing about her work. This was followed by the composer and musician Roel Hazendonk with his Beyond Doubt, specially written for the work. 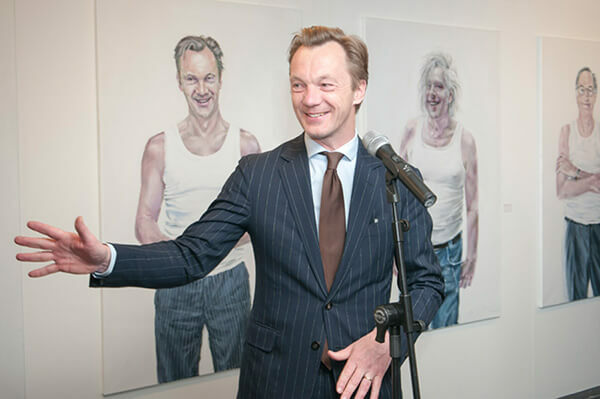 Artist Milou Hermus painted portraits of eighteen men in the previous three years. She chose men who fascinated her, from designers and writers to museum directors; men whom she had admired for years from a distance for their voice, texts or work. It was a bold venture to try to get these Dutch gentlemen into her studio and then to let them pose in a white vest. In a white space without any points of reference, they had only their identity to fall back on: a glance, a puckering of the lips, their posture, their stance, the language of their hands. This bare, direct style has characterised Dutch portrait art down to the present. The subject is the subject: no more and no less. With more than five hundred absurd picture postcards, ‘Wonder World’ opened the doors to the empire of the imagination and ushered visitors into a fantasy world full of mysterious dreams in which theatre play and irony held sway. 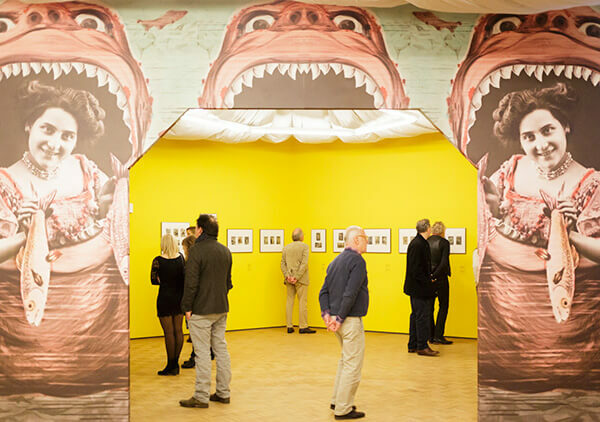 This family exhibition in the Kunsthal threw light on a forgotten part of the history of the picture postcard, which developed to become a new popular art form at the end of the nineteenth century. Between 1900 and 1914 – at a time when modern photography was still in its infancy and Surrealism had not yet been invented, yet alone the computer and Photoshop – the ‘real photo’ picture postcard became a genuine rage. The Rotterdam artist Wim Gijzen (1941-) travelled all over the country in 1972 and photographed himself with a panorama camera on a tripod as he stood beside the signs of all 863 Dutch counties that the country boasted at the time. He also bought two picture postcards in each town or village, sent one to the Rotterdam Art Foundation and kept the other himself. With the same precision he photographed the shop where he bought the postcards and the post box where he put them in the post. The 35,000 kilometres that he travelled resulted in one panorama photograph and two picture postcards for each county – one with the picture and one with the address side and postage stamp – together with a photograph of the shop and the post box. 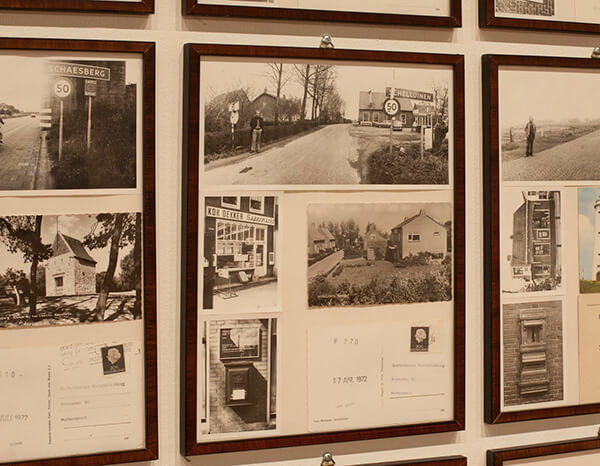 The exhibition ‘Greetings from…’ in the Kunsthal was a documentation of the conceptual art project ‘A visit to all 863 counties of the Netherlands’. In 2015 it presented a surprising picture of life in the Netherlands from the 1970s. For edition 11 of Kunsthal Light, Tim Hollander, who graduated in 2014 from the Utrecht School of the Arts, assumed the fictive role of a guest curator. Wandering and poking around in the depot and archives, he excavated ‘hidden treasures’ of the Kunsthal. The Kunsthal does not have an art collection of its own, but it does have an enormous variety of objects and materials that are used to design the many exhibitions. 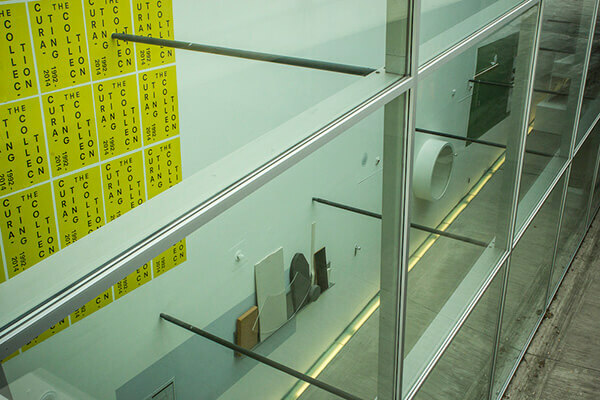 Using plexiglass covers, socles, sketches, ground plans and lists of materials, Tim Hollander exposed the infrastructure within an exhibition – using the sloping ramp of the Kunsthal as a showcase. 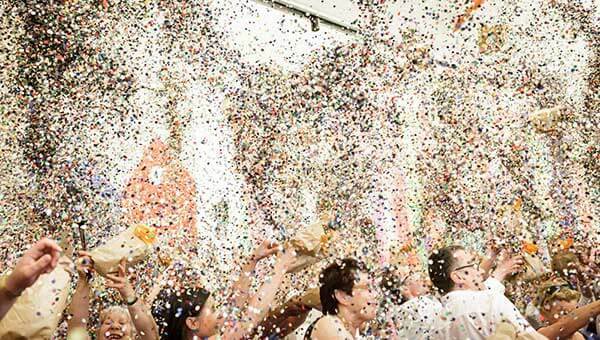 In this jubilee edition of the Festival of Real Flavour, the Kunsthal presented a fresh generation of producers who are bursting with idealism when it comes to good and healthy food. There was no end of cooking and the public could sample the best products from impassioned stall holders who make absolutely no concession on Real Flavour. More than ninety entrepreneurs offered their wares in the Market Hall – from bread that has been given time to rise and fruit that has been allowed to ripen to vegetables that come directly from the land. 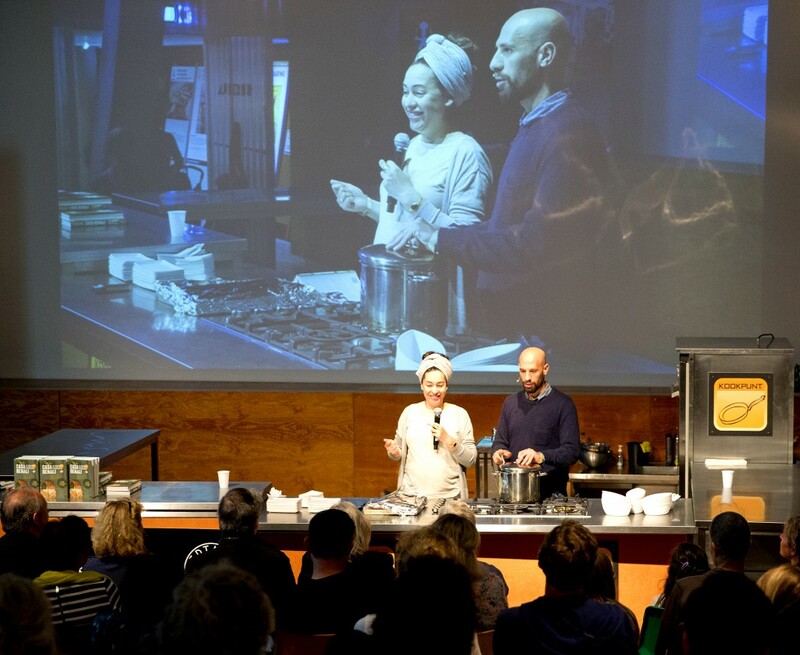 In the Cooking Theatre you could spend three days learning from film screenings, demonstrations and lectures by chefs, cultivators, barmen, vegetable improvers and seaweed cutters. Visitors were introduced to other food festivals in Rotterdam and… this year there was cultivation as well! 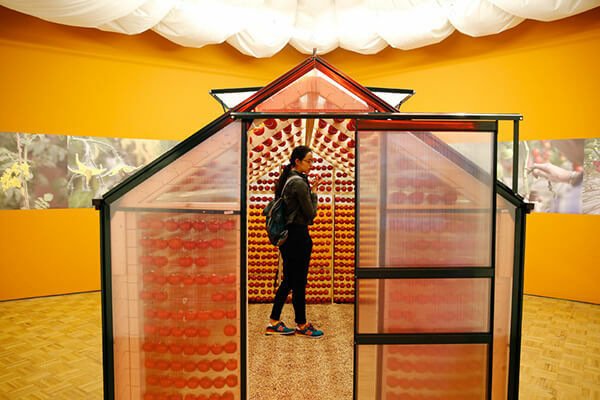 In the family exhibition ‘Tomato Factory’, every visitor, whether young or old, was challenged to find out how tomatoes grow and what you can do with this fruit (or is it a vegetable?). Visitors were cheerfully bombarded by everything connected with the tomato. Even those who were not yet contaminated by the ‘vegetable garden virus’ were challenged to discover for themselves how tomatoes grow and what you can make with them. If you went along an interactive route, you followed the entire process of cultivation from seed to plant and became a tomato expert. On the way you chose your own tomato, decorated your tomatoes, and were allowed to take your own tomato home, including a packaging that you had designed yourself. At the end the taste of the connoisseur was tested by blind sampling of the most diverse kinds of tomato. Who would not want to be a farmer, chef and director of the ‘Tomato Factory’ for a day? This summer young and old were able to join in and contribute to the exhibition ‘do it (Kunsthal Rotterdam)’. The word says it: Do It Yourself. This was public participation of the most essential kind because an active role of the visitors was of great importance for the creation of some of the many works of art. The Kunsthal invited everyone to ‘do it (Kunsthal Rotterdam’ wholeheartedly. In collaboration with guest curator Jeroen Everaert, director of Mothership, more than fifty do it instructions were selected that were carried out in the Kunsthal. Well-known Rotterdam artists including Chris Versteeg, Arno Coenen&Iris Roskam&Abner Preis and Luuk Bode were invited to implement the do it instructions of Trisha Donnelly, Jay Chung and Sol LeWitt respectively. Cultural initiatives such as Wake up in It, Baschz Leeft & Janjoost Juliens, creative individuals like Natasa Heydra, and entrepreneurs were also invited to join in do it. Opperclaes – a platform for young contemporary art – selected contemporary calligraphers and muralists – including Guido de Boer, Thomas Trum & Koen Taselaar, ATTAK, The Phoney Club, Bijdevleet and Joseph Hughes – to visualise do it instructions by Stephen Kaltenbach, Marjetica Potrč and Louise Bourgeois in the exhibition. The exhibition ‘150 scale models by students TU Delft’ presented the results of an intensive scale model workshop that formed part of the assignment to design a new and improved Kunsthal in nine weeks. Students from the Faculty of Architecture at the Delft University of Technology concluded their Bachelor of Science with this graduation assignment. The workshop was preceded by thorough documentation, lectures and an excursion to the Kunsthal. The students determined their position with the scale models and chose the centre of gravity of their definitive design. 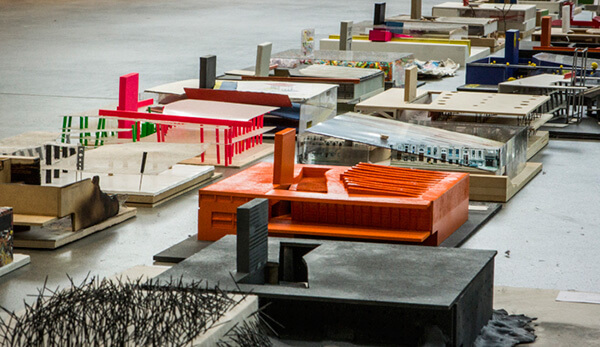 The sketch models of the Kunsthal – made in a single day – show 150 different interpretations of the iconic building that Rem Koolhaas designed in 1992. The Kunsthal Rotterdam organised the first solo exhibition in the Netherlands of the Austrian artist Mathias Kessler (1968). Kessler’s work is an inquiry into the (historical) relation between people and nature. He grew up in the Austrian Alps and sees a conflict between reality and fantasy in the experience of nature. During his childhood he felt as though he ‘grew up in some one’s holiday’. Kessler is fascinated by the human interpretations of nature and its aesthetic representations. The focal point of the exhibition was the installation Nowhere to be Found, an installation with a human skull in an aquarium surrounded by living corals. 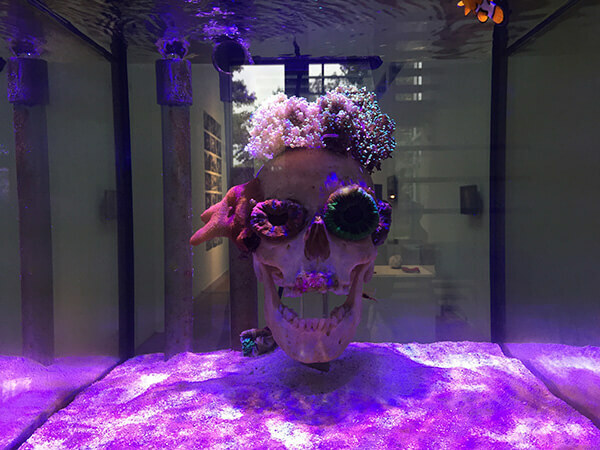 Salt water and UV light simulated a tropical environment and thereby created an artificial setting in which the corals derived the greater part of their energy from the skull. His prominent work ‘Sunset in Simulacrum’ on the outside of the Kunsthal could be seen by passers-by in the Museumpark. In the autumn the Kunsthal presented drawings, paintings and sculptures by Arie Schippers (1952-), one of the most multi-faceted Dutch artists of the last few decades. Schippers’ oeuvre is rich in themes, makes use of a variety of materials, and is authentic in its brushstroke and execution. His motifs and themes are found everywhere: outdoors, indoors, while travelling, around the corner… He draws people, animals and landscapes in all kinds of circumstances, either from his own observations or from his imagination. 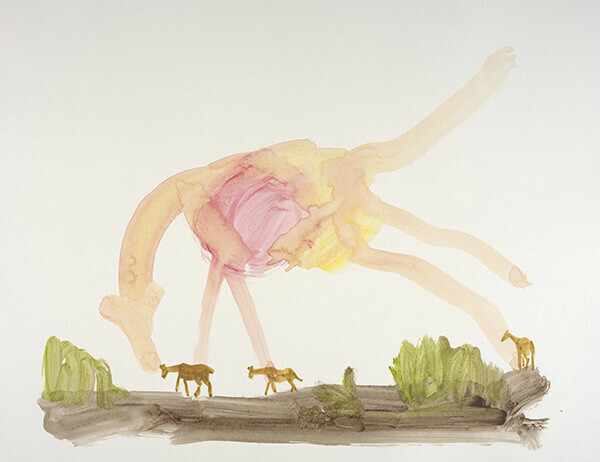 The exhibition ‘Paint becomes bird’ was an ode to the fantasy with which Arie Schippers creates grandiose and intimate works with just pencil and paper, paint strokes or clay – from imaginary clay portraits to painted figures, from contemporary landscapes in pencil to poetic animal fables in watercolour. In 1997 the Kunsthal already exhibited the series ‘Nocturnes’, paintings of the modern city by night, by Arie Schippers. The Belgian photographer Titus Simoens (1985-) has been working since 2011 on a series about boys who spend their schooldays under a strict regime. 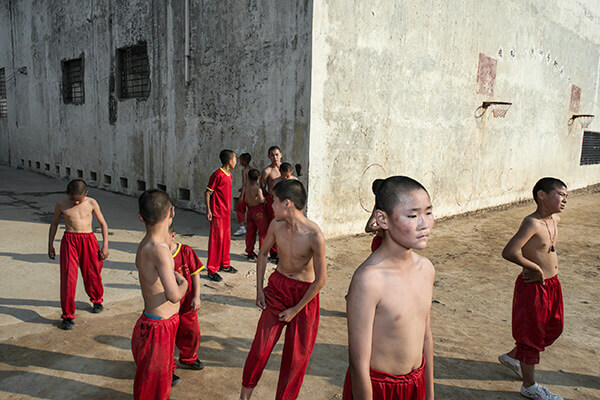 He takes the viewer to the IBIS school of navigation in Ostend, a Chinese Kung Fu school, and a boxing school in Cuba. The boys lead a school life that is strictly disciplined. Years are spent on creating prospects for the future of which only a few will reap the benefit. Simoens presented photographs that showed the brief moments of doubt, camaraderie, loneliness and enjoyment in which these pupils, who share the same life and destiny, escape from the yoke of obedience for a moment. Besides Simoens’ photographs, many shots were shown made by the boys themselves with disposable cameras made available to them by the photographer. Aura Rendón Benger (1989-) graduated from the Koninklijke Academie voor Beeldende Kunst in The Hague in 2014 with large objects of kite material filled with air. When they are positioned, filled and suspended, these ponderous and at the same time light ‘beings’ occupy the space. The long narrow space of the Kunsthal showcase was the ideal location for the recurrent themes in Rendón Benger’s work such as distance, proximity, intimacy and the role of the public. Rendón Benger played in her interactive installation with childlike joy and sensual experiences of visitors who clashed with the objects as they made their way through the space. The interaction with the architecture of the Kunsthal added an extra dimension for the public, who could watch the performance executed by the visitors from the outside. 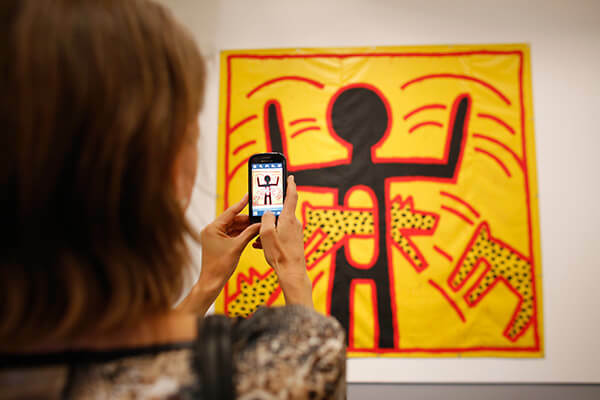 In the autumn the Kunsthal presented a large-scale exhibition on the life and work of the influential US artist and activist Keith Haring (1958-1990). ‘Keith Haring. The Political Line’ was the first exhibition in the Netherlands to go into the social and political aspects of his life’s work in detail. Haring’s impressive works criticised the excesses of capitalism and campaigned for nuclear disarmament, environmental protection, the struggle against AIDS, and equal rights for all. One hundred and forty works of art showed a less well-known side of the world-famous artist. To personally experience the impressive works of art is a visual spectacle. Twenty-five years after Haring’s death, his art still has as much to tell us as ever. With his daring, unmistakable personal style, Keith Haring, who was a protégé of Andy Warhol, unleashed a revolution in the art of the 1980s. The thematic arrangement of the works of art in ‘The Political Line’, combined with diary fragments and other archival material, showed how committed Haring was to the social and political issues of his day. Besides the exhibition there was the Keith Haring Weekend with among its activities the Keith Haring Community Art Project in which the public joined in to make a large-scale work of art. The exhibition ‘Red Wealth. 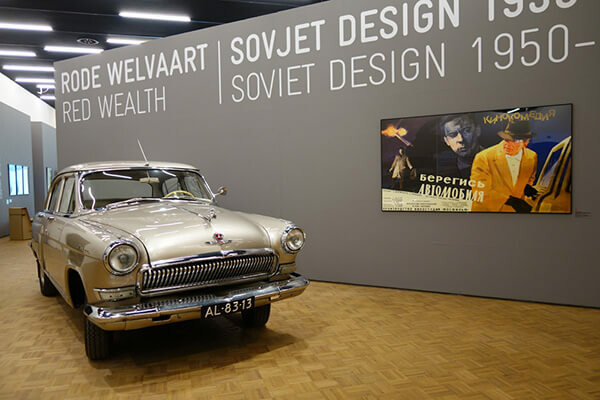 Soviet Design 1950 – 1980’ presented a fascinating survey of the history of Soviet design. Communism and consumer culture did not go together until the 1950s, but this changed in 1959 with the presentation of ‘the American way of life’ in an exhibition in Moscow. The memorable debate between party leader Khrushchev and President Nixon took place among the abundance of commodities, and the arms race was extended on the spot to include the competition for prosperity. More than 360 objects show the best examples of Soviet design, from charming retro products and graphic designs to prototypes that stand for a systematic, functional and social approach to design. During Art Rotterdam Week 2016 a debate was organised in the Kunsthal with speakers from the Moscow Design Museum and other experts. In the exhibition ‘I’m going to write a children’s book when I grow up’, the photographer and film director Johan Kramer and his daughter Lila Shu investigated how to become a children’s book author. Together they visited well-known Dutch writers of children’s books such as Yvonne Jagtenberg, Tosca Menten and Annet Huizing on their favourite writing location, Lila armed with pen and paper and Johan with his camera. On the occasion of the Children’s Book Week 2015, the Kunsthal showed the results of their field research: inspiring and motivating stories of authors accompanied by photography. The exhibition encouraged children to use their imagination and to get down to writing themselves. The exhibition ‘Knitwear. From Chanel to Westwood’ in the Kunsthal Rotterdam offered an inspiring survey of fashion knitwear from the 20th and 21st centuries. More than 150 works came from the famous English collection of Mark and Cleo Butterfield, covering more than a hundred years of knitwear history, including rare designs shown here for the first time, from nostalgic and romantic to rebellious and over the top. The material and technique of knitting is a constant source of inspiration for designers. Highlights included rare Chanel cardigan suits, 1930s woollen swimwear and vibrant Missoni patterns from several decades. There were Edwardian petticoats in red and black chevron stripes, knitted evening dresses from the 1930s by ‘Coco’ Chanel, and conceptual designs by Comme des Garçons and Julien MacDonald. Plus Bill Gibb designs from the 1970s and later, innovative designs by Vivienne Westwood and Sibling, who gave classic knitwear styles a new twist with their cashmere panther print twin-sets and other playful creations. The exhibition also explored technological innovations in hand, machine and industrial knitting and the current renewed interest in handicrafts. During the Art Rotterdam Week a special Museumpark Fashion Tour was organised in collaboration with Urban Guides that took in Het Nieuwe Instituut, Museum Boijmans van Beuningen and the Kunsthal. In collaboration with the film and documentary producer Wim van der Aar, the Kunsthal Rotterdam presented an exhibition on the rise and fall of the eccentric Dutch Van Waveren family. When in 1996 Van der Aar found a box of audiotapes on the Waterlooplein flea market containing sixty hours of the most bizarre telephone conversations, he set out to discover where they had come from. His trail led him to Guido van Waveren, a member of a famous family of bulb growers from Heemstede. This marked the start of a large-scale investigation of a family with a story. Wim van der Aar built up a sizeable archive and was invited to make a documentary ‘The Van Waveren tapes’ by the VPRO in 2012, followed by the stage production ‘Van Waveren. The demise of a Dutch family’ in the RO theatre in 2015. The Kunsthal presented the third part of his investigation. 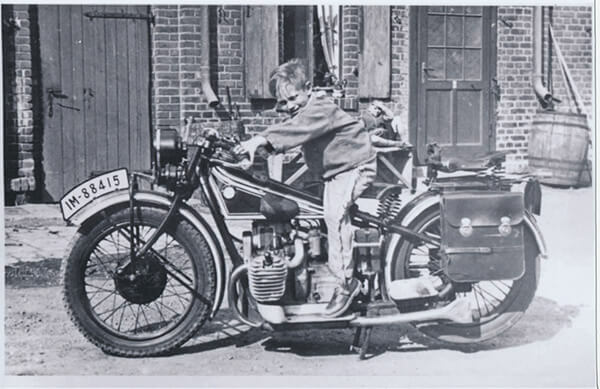 The photo exhibition with more than 60 original and enlarged family snapshots focused on Ben van Waveren (1928), a cousin of Guido and son of the rather controversial Frank van Waveren. The Kunsthal finally gave visitors the opportunity to see the real Van Waveren family.